In the past years, in the EU, there is a new trend to talk about unions. Everything started with the banking union because this has been the greatest step toward deepening the European integration since the introduction of the single currency. It is completely justified to call it a banking union because it goes beyond the existing EU treaties. In the beginning of 2014, after Russian President Vladimir Putin annexed Crimea in violation of international law, the then prime minister of Poland Donald Tusk proposed the establishment of an energy union. His idea was this new union to be as ambitious in terms of deepening of the European integration as the banking union is in such a difficult area as energy. When he was elected president of the European Council Donald Tusk promised that the establishment of an energy union will be one of his main priorities. The leaders of the member states included all this in their strategic guidelines for the Commission and Jean-Claude Juncker made it as one of his leading priorities. The energy union was one of the awaited events in the beginning of this year. 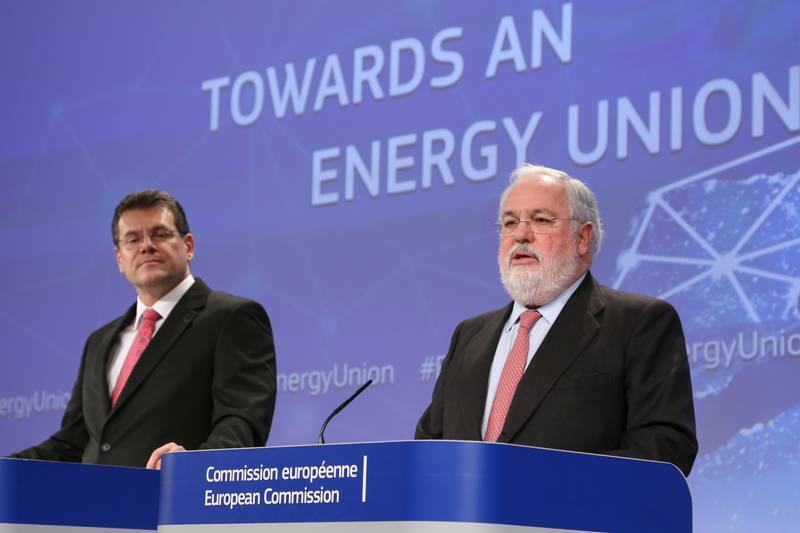 The long-awaited moment came on 25 February when Vice President Maros Sefcovic, tasked with the building of the energy union, presented together with energy commissioner Miguel Arias Canete the Commission vision. However, neither the proposal is sufficiently ambitious to enable calling it an "energy union" nor the debates that followed it in the European Parliament corresponded to something as important as ensuring Europe's energy security. 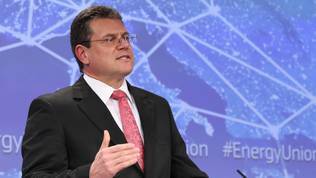 Especially after Maros Sefcovic set the lath so high by comparing the energy union with the creation of the coal and steel community. 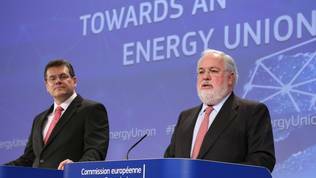 As a matter of fact, what the European Commission vice president presented on 25 February was simply beating the dust out of the strategy for energy security, which the previous Commission presented last May. At the core of Sefcovic's and Canete's strategy is the implementation of the existing legislation. This includes, most of all, the third energy package, the construction of interconnectors between the member states, completing the single market of energy and energy efficiency. The latter is the most important priority of the Commission and is entirely in the spirit of the currently prevailing philosophy in Brussels that the cheapest energy is the energy not spent. The strategy sets a higher target for reduction of the CO2 emissions of 40% by 2030. This is the position the EU will be promoting at the Paris climate conference later this year. As long as the third energy package is concerned, which was at the centre of the conflict between EU and Russia, the Commission commits to use "all available policy instruments in this regard and will insist that Member States fully implement and enforce the 3rd Internal Energy Market Package, in particular as regards unbundling and the independence of regulators". Juncker's Commission plans to focus on the construction of the southern gas corridor the purpose of which is to secure gas deliveries from Azerbaijan and Turkmenistan to Europe. What is new in the strategy for the energy union is that at this stage no serious change is foreseen in the relations with Russia. "When the conditions are right, the EU will consider reframing the energy relationship with Russia based on a level playing field in terms of market opening, fair competition, environmental protection and safety, for the mutual benefit of both sides". It does not say, however, what is understood by "right conditions" - is this the long-term solution to the Ukraine conflict or is it an expectation the power in the Kremlin to change because the current president Vladimir Putin has proved that he is an unpredictable partner who has used the energy resources as his main foreign policy tool. Therefore, the most important and long-awaited by some member states element of the energy union, which is the collective bargaining of gas contracts with third countries, is reduced to the bitter reality. It is pointed out that all intergovernmental agreements must be completely in line with the European legislation. It is admitted that bilateral contracts that are in violation of the European rules are very difficult to renegotiate. Bulgaria has experience with that. "The positions of the signatories have already been fixed, which creates political pressure not to change any aspect of the agreement". That is why, the European Commission proposes in the future to be informed in advance so as to make an assessment at the early stage of the negotiations whether the future contract is in line with the European legislation. The Commission also proposes to take part in the negotiations. All this, however, is written in a wishful tone and nothing binding is proposed that could secure the implementation by all the 28 member states. The Commission envisages also to expand the mandate of the Agency for Cooperation of Energy Regulators (ACER), established with the third energy package, because, at present, it deals only with issuing recommendations and opinions. Its rights for decision-making are too restricted, especially in cases when a member state does not apply a decision in the defined period. The Commission believes that it would be better if the agency performs its regulating functions at European level and not as it is currently to reflect the national views. This is valid for all the bodies established with the third energy package. In addition to this is also the Commission desire to ensure greater transparency in terms of the forming of energy prices by proposing the establishment of detailed monitoring and reporting. Special attention will be paid on the regulated tariffs, energy taxation and subsidies. An important element of the transparency will be the Commission to also check the bilateral contracts with third countries for gas deliveries and to give advice what are the prices in the contracts of other member states. This will hardly be open to the public because in the strategy it is explicitly pointed out and Mr Sefcovic emphasised on it several times during the presentation on 25 February, that the confidentiality of sensitive trade information will be respected. The strategy says that of all the 28 member states six are entirely dependent on a single supplier. Those are Bulgaria, Estonia, Finland, Latvia, Lithuania, Slovakia. Even if they know that, for instance Germany, had negotiated cheaper deliveries this will hardly help them in the negotiations with a "persuasive" partner as Russia whose main argument is stopping the deliveries. The strategy again raises the question about the possibility consumers to be able to select suppliers even in another member state. This needs additional adapting of the national regulatory frameworks because a large part of the European households continue to be passive consumers. No matter how good this idea is, it continues to be hard to realise. In the end of the day, the member states are resisting to abolish the roaming charges, which makes it unrealistic to expect that they will be willing to allow consumers in one country to be able to choose an electricity supplier in another because of better prices, for instance. The Commission also proposes energy to become an indispensable part of the trade negotiations with third countries, the so called "energy diplomacy". It is pointed out that the European Emissions Trade System (ETS) will continue to be the most important instrument to achieve the CO2 targets despite that the existing studies of its efficiency are quite controversial. The strategy touches vaguely and has a liberal attitude to nuclear energy and shale gas. Concerning nuclear energy, it only says that when a decision is made for new capacities or for a new nuclear power plant, the member states should be led by "highest standards of safety, security, waste management and non-proliferation". Shale gas is neither rejected nor recommended. The strategy points out only that its production "is an option, provided that issues of public acceptance and environmental impact are adequately addressed". The most important part of an energy union, undoubtedly, is its governance, again, if we judge by the experience with the banking union. On this issue, the Commission says only that it is yet to present its ideas about that. It is hinted that the European semester for economic governance will be used as a model but is pointed out that the two processes will be completely separated. What the Commission reveals at this stage is that it will work to improve the data, analyses and intelligence and will report annually to the European Parliament and the Council about the situation of the energy union. Is it because the strategy was presented in the European Parliament almost immediately after it was made public or for other reasons but the debate with the MEPs on this so important topic was apathetic and many of them demonstrated they were not well aware of the new/old strategy. Those who spoke in specific terms about the strategy during the two-hour long debate were a few. 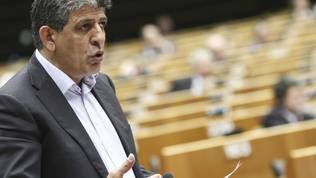 Most of the speakers were members of the energy committee of the European Parliament. 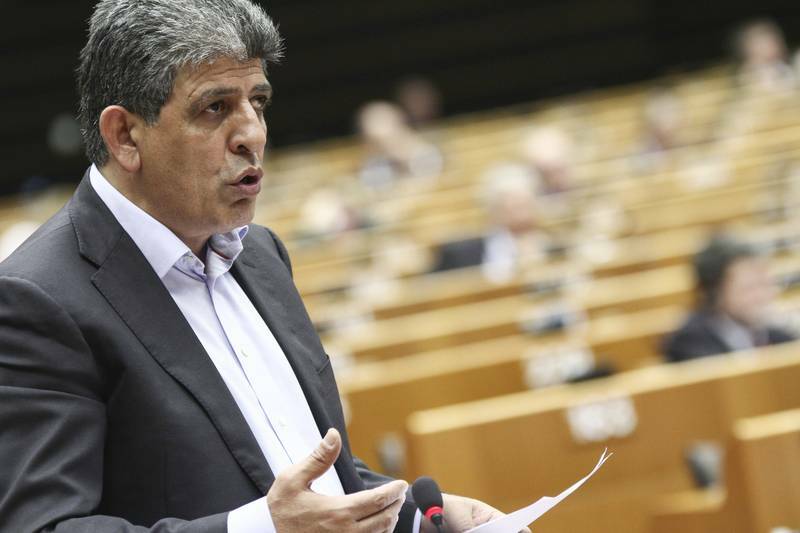 According to Cypriot MEPs Neoklis Sylikiotis from the far left group, the strategy has some serious omissions. The most important of them is that it only mentions the need of interference by the Commission in the energy policy of the member states or to participate in negotiations on energy deals but, practically, this remains to be national responsibility. In response, the Commission bases its argument on the fact that energy policy is still a national competence, according to the treaties. A very weak argument against the backdrop of the banking union. According to green MEP Rebecca Harms (Germany), the Commission risks with this proposal to play out its chances. "What you are proposing is not aimed at the modern technologies but at the past". She was indignant that although not explicitly mentioned in the strategy coal continue to play a major role in the strategy. According to her, Turkmenistan and Azerbaijan cannot at all be called secure countries but are mentioned in the strategy as an alternative to Russia. "You are encouraging nuclear energy although the majority of citizens are against", she concluded. Danish MEP Morten Helveg Petersen (ALDE) pointed out that a more ambitious governance is needed of the energy policy and that it needs to focus more on renewable sources. He gave the example of the recently announced huge investment by Apple in Denmark which was made possible precisely because of renewable energy in that country. Gerben-Jan Gerbrandy (S&D, the Netherlands) recalled that this is a political project of great importance. "Geopolitics plays here an important role". He called the deal between Hungary and Gazprom "odd" and pointed out that it is very likely the gas deliveries for Ukraine to be interrupted. 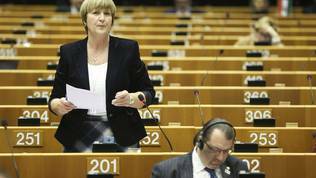 "Let us not make the economic mistakes of the past", the Dutch MEP called. As could be expected, some voices from the Czech Republic and Hungary were in defence of Russia and the energy status quo in Europe. Zoltán Balczó, MEP from the radical right-wing party Jobbik, said that the relations between EU and Russia should be maintained. "The Union's energy policy should be conducted in such a way that the individual member states to be able to keep their sovereignty". Evžen Tošenovský (ECR, Czech Republic) said he was against the establishment of a common European regulator. It is much more important, according to him, to discuss the functioning of the existing body. Another green MEP, Claude Turmes (Luxembourg), also criticised the strategy for being too unambitious, especially in terms of renewables. The energy security renewables can ensure is much greater than us relying on gas and oil deliveries from Azerbaijan, Kurdistan and Turkmenistan. He opposed also the introduction of a new category in the Commission document of "smart consumers". Do not call them in this way, he called, the citizens are citizens with their rights. Mr Turmes appeal on the Commission to work more precisely with the citizens and the national parliaments to ensure support for its most ambitious ideas. Matthias Groote (S&D, Germany) called for clear legal acts not for strategies. Many others criticised the strategy, too, for lacking specific proposals. Milan Zver, a MEP from Slovenia (EPP), said Putin would never stop using energy for political purposes, which is why it is very important to work for domestic and external diversification of deliveries. Croatian MEP from the ECR group Ruza Tomasic also said that the EU is necessary to ensure the energy independence of the member states. Moscow is currently buying the silence of the more dependent ones. "Energy dependence cannot be used to limit the sovereignty of countries", she added. 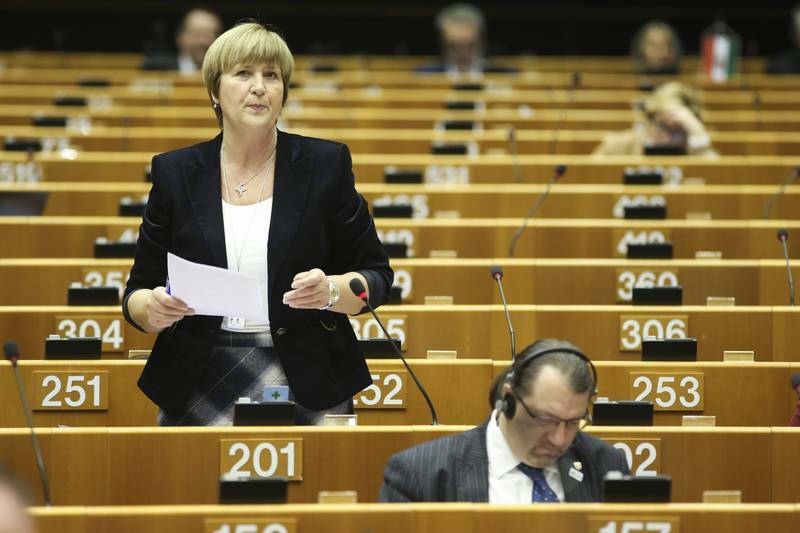 Her colleague from the same group Angel Dzhambazki was t he only Bulgarian MEP who spoke although the energy union was one of the major topics in the election campaign last year and a priority for one of the coalition partners in the government of Bulgaria. Mr Dzhambazki recalled that the political "brawls" surrounding the South Stream project have left the Bulgarian economy without this key economic resource. According to him, the development of nuclear energy is very important. All Croatian MEPs who spoke during the debate actually lobbied for European support for the construction of a LNG terminal at the Adriatic coast. In the Commission strategy for the energy union, it is envisaged the Commission to soon present a special proposal for the development of LNG trade, pointing out in the same time that the building of LNG hubs in Northern Europe will increase energy security. It is recommended this example to be followed also by the Central and Eastern European countries and the Mediterranean nations. Regarding Central and Eastern Europe, the strategy speaks of building of trust. Generally, both the debate and the strategy itself were pretty mediocre and lacked serious ambition. The strategy for the energy union is entirely in the spirit of the policy of the European Commission under Jean-Claude Juncker to be as close as possible to what is realistic, which means to the member states rather than being a source of vision for European integration as was his predecessor Jose Manuel Barroso. Which of the two policies is better is still early to say, but it should be mentioned that the solo vision of the former prime minister of Portugal, Barroso, about the future of the euro area was much more ambitious than the one Herman Van Rompuy prepared together with the Eurogroup chief (Juncker himself at the time) and ECB chief Mario Draghi. And although the leaders rejected it in the beginning, it still is a major part of the debate about the future of the euro area and Mr Juncker announced that he will use it too. So, the expectations for an energy union were the Commission to present a vision and ambition it will insist on and not be a spokesperson of the member states because they already have one - Donald Tusk. It is true that there is a lot of potential in working to build the internal market and that the implementation of the existing legislation could bring a lot of benefits that could create appropriate environment for the next stage of integration. But it is also true that the current geopolitical situation provides, indeed, a golden opportunity to move up to the next level of integration in the EU just like the eurozone crisis created the conditions for the banking union. What united the member states then was their common currency. This means that the energy union should find the equivalent of the euro in terms of importance. This is what the Commission strategy lacks. Moreover, the banking union simply responded institutionally to the already existing integration at market level. Alas, this is the weakest spot of the energy union - there is no sufficient energy connectivity among the member states that can make it absolutely necessary for everyone to protect their common energy security. The treaty on establishing the coal and steel community, which lays the foundation of today's EU, was signed in Paris on 18 April 1951. The main idea behind it was to unite the production because those were the two most important raw materials for the industries of the two countries. The aim of the community was to contribute through the common market of coal and steel for economic development, growth of employment and for the increase of the standard of living. Experience suggests that this was a very wise decision given the geopolitical circumstances then. 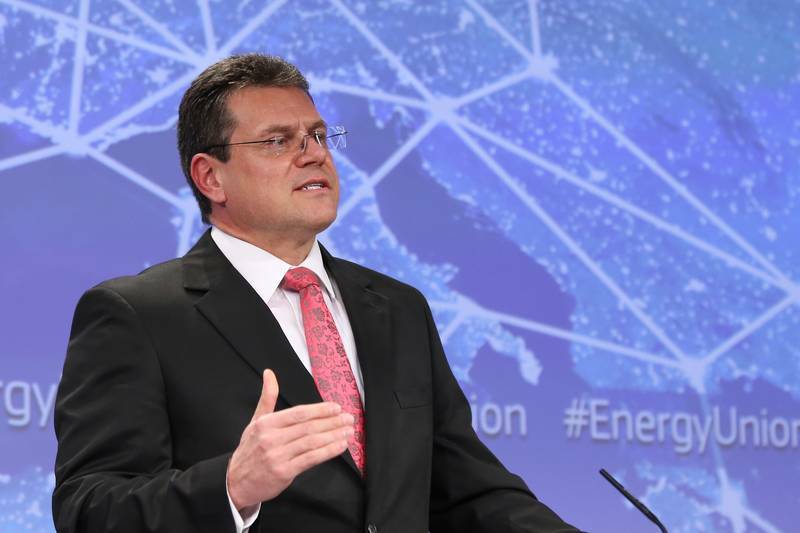 The strategy for an energy union proposed by Maros Sefcovic is too far from the ambition of the coal and steel treaty and is too inadequate against the backdrop of the new but, in fact, the same as more than 50 years ago, geopolitical circumstances. The Commission strategy for the energy union will be one of the main topics on the agenda of the spring European Council in Brussels on 19-20 March.